Fallow land, vacancies, anonymity, standstill – not everyone between Dortmund and Duisburg wants to accept this. On the contrary. An increasing number of people are discovering possibilities and intervene in everyday urban life. A living room in the middle of the street, neighbourhood, community gardens. Town centres, repair cafés and tenants‘ initiatives arise from the niches of the cities – independently, self-determinedly and collectively. 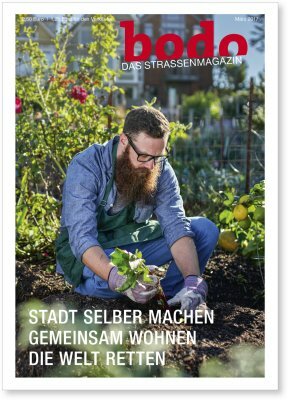 Das Gegenteil von Grau / The Opposite of Gray shows different groups, who bring practical utopias and free spaces to live and fight for a solidary and ecological coexistence in the urban space. All screenings in Berlin with English subtitles / OmeU. The movie can be seen in Berlin cinemas Moviemento, Lichtblick and Central. This is the motto of the March issue of the city magazine bodo produced in Dortmund and Bochum. 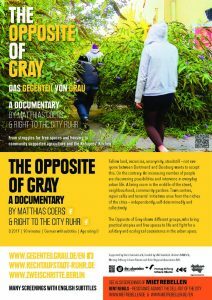 It contains a detailed interview with filmmaker Matthias Coers talking about the documentary DAS GEGENTEIL VON GRAU / THE OPPOSITE OF GRAY and the movement in the niches of the cities. 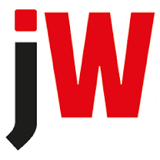 In the daily newspaper junge Welt the publicist Bernd Drücke discusses the movie. Journalist Peter Nowak about DAS GEGENTEIL VON GRAU / THE OPPOSITE OF GRAY in the federal edition of the daily newspaper Neues Deutschland. English website of predecessor movie MIETREBELLEN / RENT REBELS – Resistance against the sell-out of the city. Photo reportage about housing in Berlin in English. Special thanks to Vera Aulenbach for the translation.